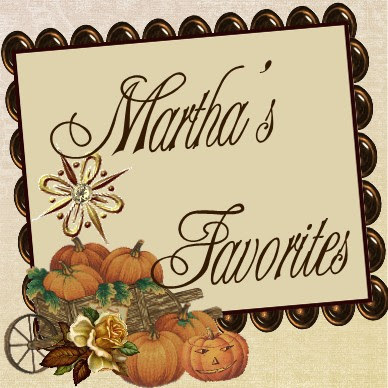 Martha's Favorites: OUR 6TH TEA CUP TUESDAY! 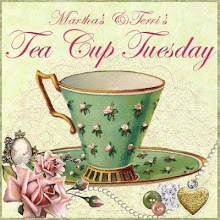 OUR 6TH TEA CUP TUESDAY! Hi Ladies! Hope you all had a wonderful Easter. My was spent with family. My children shared Easter breakfast and church with Mom. Nothing makes me happier than having my children in the church they were raised in. We were able to praise the Lord as a family! That was my Easter gift and it was perfect. My husband and I spent a quiet evening together watching "The 10 Commandments". It was perfect. God is good. Well, this is our 6th Tea Cup Tuesday! Each week you have shared so many beautiful tea cups. The cups are as diverse as you are. I can't wait to see what you have for me to look at this week. Remember, anyone can join, the more the merrier! 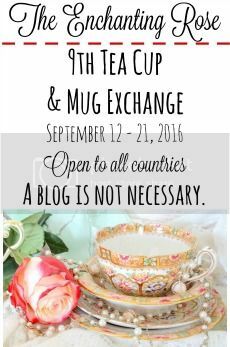 Please tell you tea cup loving friends! We want to take a peek. All you have to do is fill in the "Mr. Linky". It does it all for you. The cups I am sharing is week are blue. The first one is the blue daisies. It is a Queen Anne from England. Love all the blue daisies. It reminds me of my beloved sister-in-law, Maureen, who just loves daisies. I just might have to send it to her. 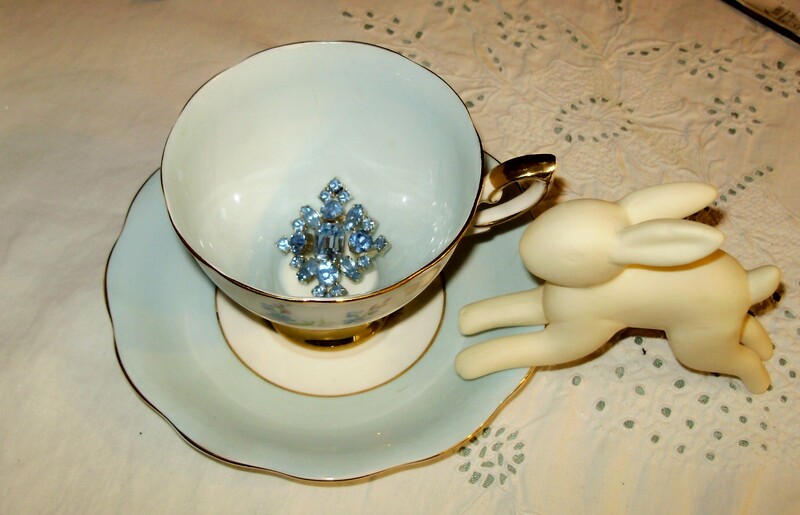 The other pale blue tea cup is a Royal Standard, England. It looks very Easter like to me, in a delicate, pale blue color. 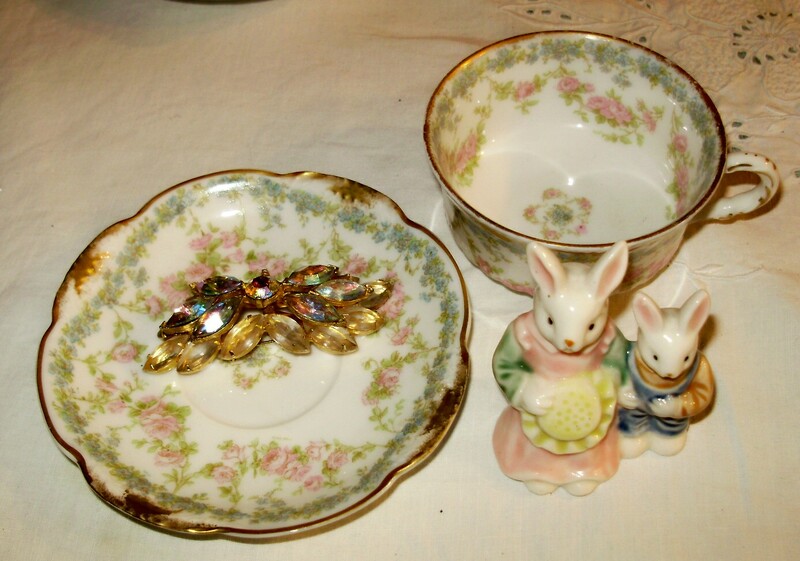 The last two are both Haviland, Limoges. Did I ever tell you I collect Haviland, Limoges? Well, I do! This manufacturer is my all time favorite. 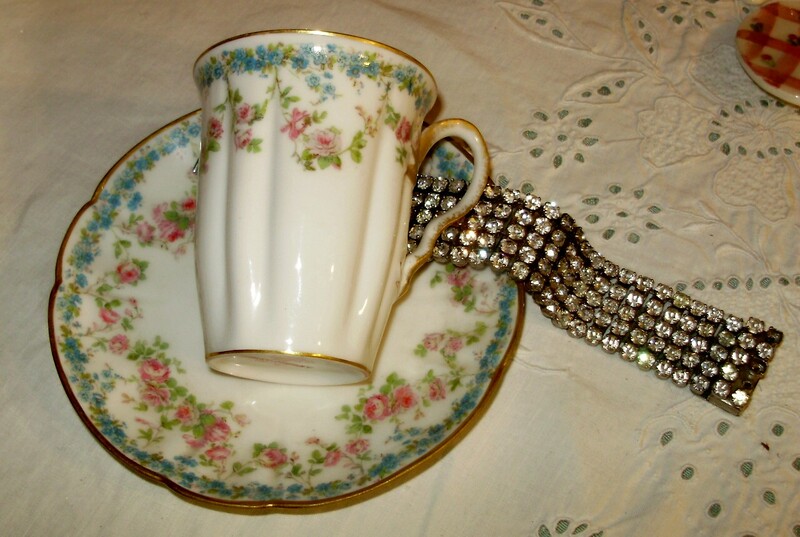 I collect their cups, dishes, anything Limoges, I just love. I have three sets of dinner ware, beautiful. I just need to show you them. I will soon, I promise. Limoges would be another reason for therapy. 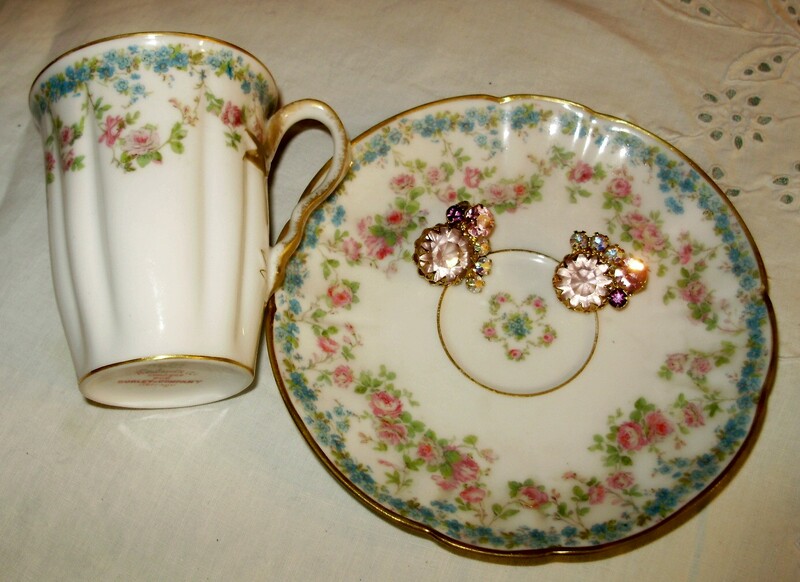 Did I mention the Limoges cups are demitasse? The handles on these cups look like gold ribbons. The last pictures I am going to show you are of Noah. 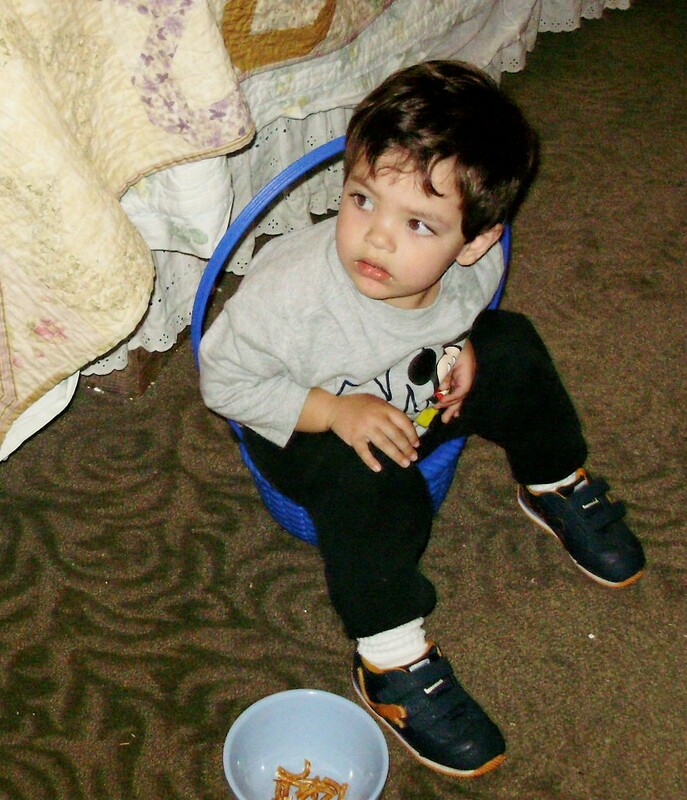 He said he was my Easter present and he sat in a basket. He looked so cute. 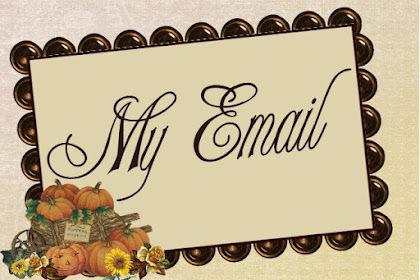 Please don't forget to visit Terri, at http://artfulaffirmations.blogspot.com/. She is the brains of this twosome. 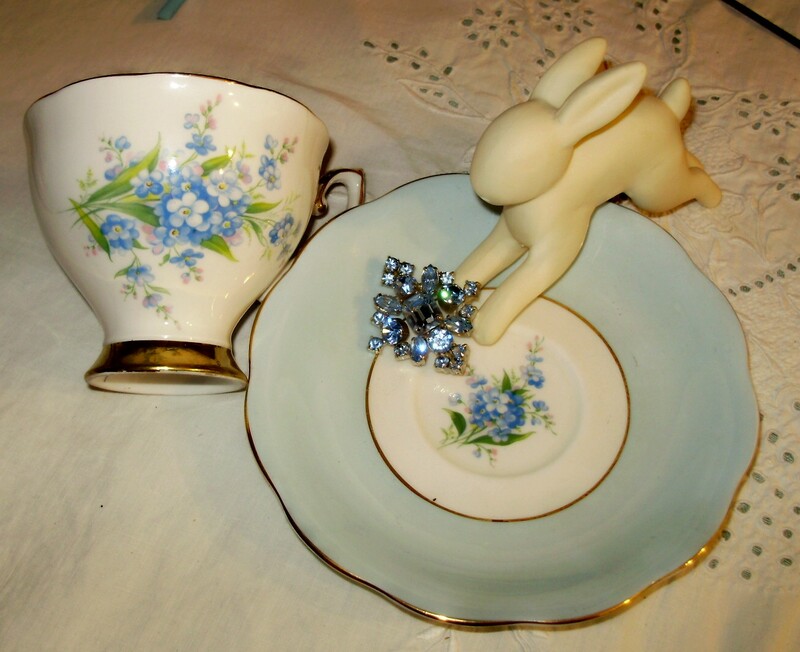 Her post always includes some history about her tea cups. Very informative and her tea cups are always stunning! Oh Martha what a lovely post.. 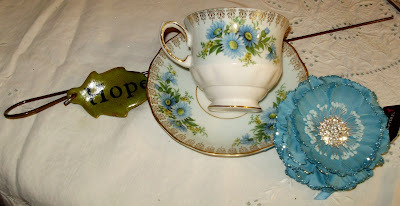 I absolutely am in love with pale blue atm... and adore your cups.. especially the first one!!! Wishing you and yours a Blessed, although belated Easter.. Some more gorgeosus cups, they ar all beautiful!! The little man at the end is not too bad either!!!!! HI Martha...oh my..I love the blues..and I am smitten with that blue brooch/jewlery! Dazzling and gorgeous! your photos are filled with sweetness and charm as always! Hope you had a Fabulous Easter! Happy Tea Time too! I meant to have a post for today but with Easter clean up and work, just could not get to it! Hopefully, next week. 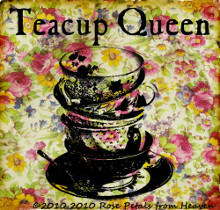 I love all your tea cups!! Your just have the most wonderful things to look at!! 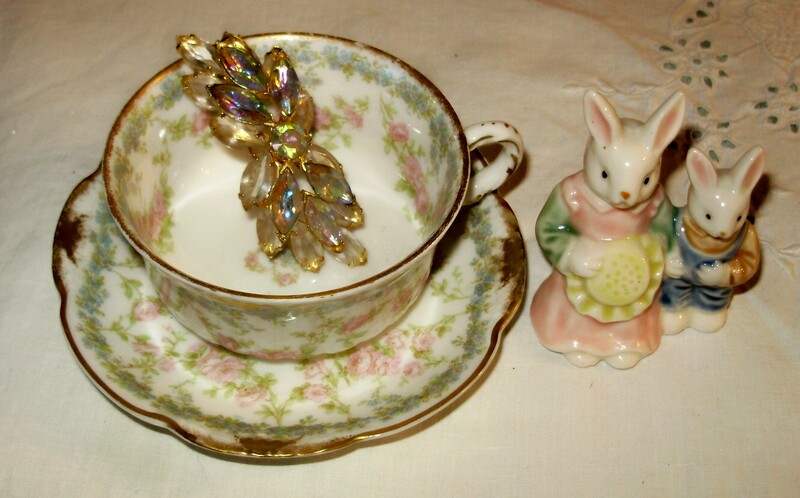 Although I've loved all your teacups I think that top one if my favorite ever! Really gorgeous. And your rhinestones (or are they jewels?) are lovely. But the sweetest of all is that little huggable/kissable feller! The tea cups are so beautiful - I especially like the shape of the cup in your first photos. This is such a lovely post. 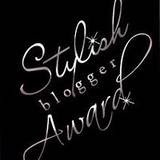 Thanks so much for visiting my blog and have a lovely rest of the week. 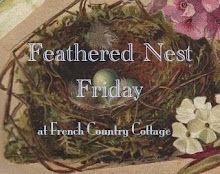 Lovely post and glad that you had a lovely Easter with the family. Love Noah in the basket gift, cute. 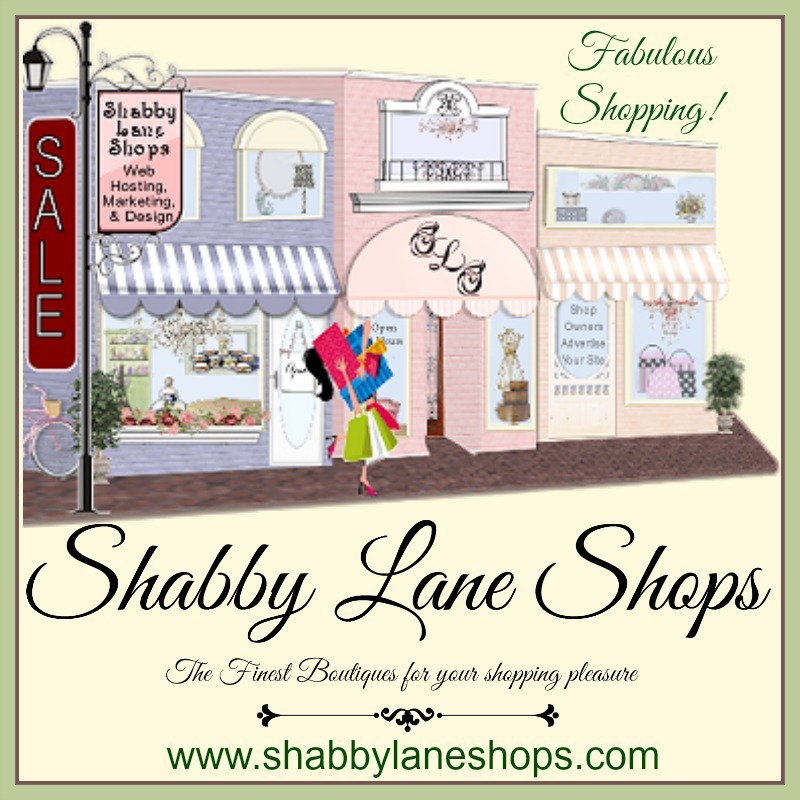 I am in love with all your beautiful cups and pretty jewelery. You have so many wonderful things at your house. I just love the way you display your beautiful bobbles with your charming cups. Priceless! Little precious Noah cracked me up. It's so sweet that he's offering himself up as your Easter present but it looks like he's got himself a 'basket potty' there. Heehehehe! Sorry...can't help myself...I'm just that kinda chick! 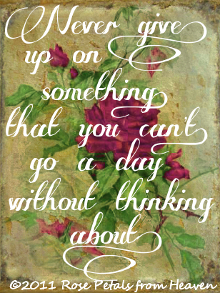 God bless and have a terrific Tuesday!!! My, your teacups are pretty! I love them all; couldn't choose a favourite. I'm glad you had your family join you for church; that's so important for families to spend time together, especially in worship. 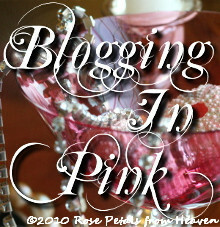 In case I have never told you, your blog is very pretty! I just love the violets. Have a beautiful week. Beautiful cups this week and BEAUTIFUL grandson! What a special treat to see him along with teacups in blue! I adore your posts and as a grandmother (I'm "MEME"), I SO appreciate your love for Noah! Thanks for sharing and the first cup is my favorite. I love it's shape! 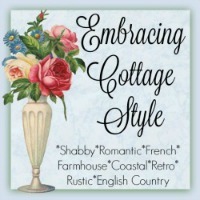 Just found your beautiful blog via Ritas Shabby Chic Rose. What a lovely collection of teacups especially the top one. The pretty baubles add the perfect touch. 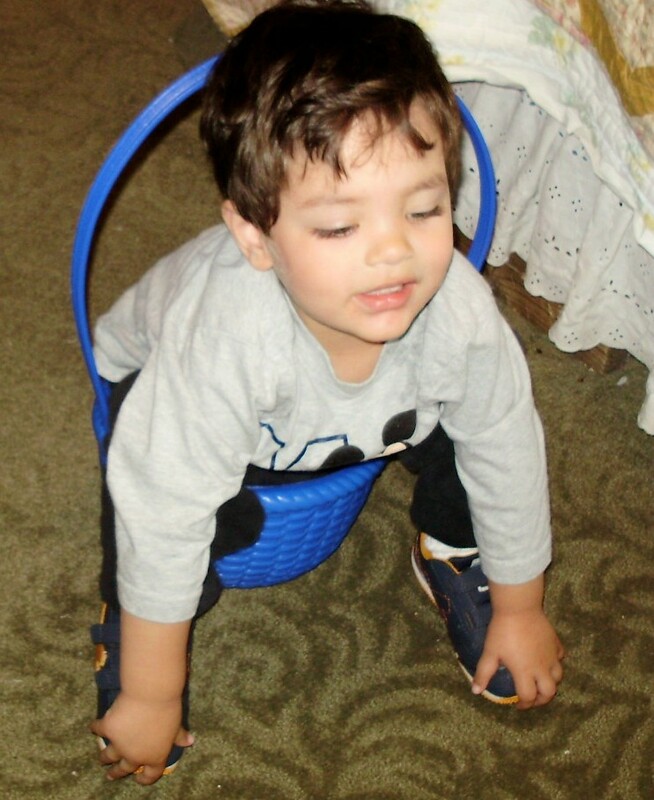 Little Noah is adorable and what a fabulous Easter gift! 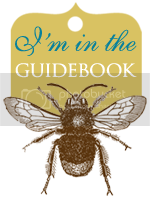 I'll be following along and will be back soon. beautiful teacups... especially the Havilland ones.. I have few saucers of the same pattern/floral design.. how I wish have the cups to match it with.. have a great week..
Beautiful tea cups Martha. I am happy you had a good Easter with your family. Hi Sweet Martha! Hope you and your family had a wonderful and blessed Easter! I just LOVE the way you picture your beautiful teacups with co-ordinating jewelry ~ two of my very favorite things!! So glad you had a lovely Easter with your family! Noah looks like the perfect Easter present to me! Little boys are so funny and cute! Love your tea cups. 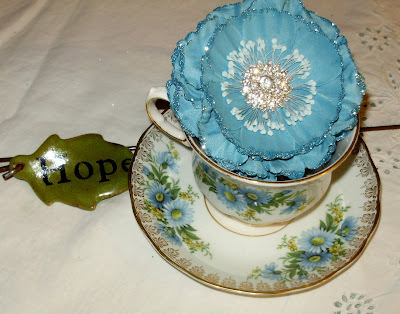 Especially that beautiful blue cup and saucer. Thanks so much for stopping by. HAPPY TEA CUP TUESDAY NO. 9! TEA CUP TUESDAY NO. 8! TEA CUP TUESDAY NO. 7!